The Mata-mata Turtle of the streams of northern South America has restructured itself into an elegant fishtrap. When a growth of algae covers the shell it is almost impossible to recognize the turtle hiding at the river bottom. Each scale of the shell rises to a peak and the edge of the shell is jagged. 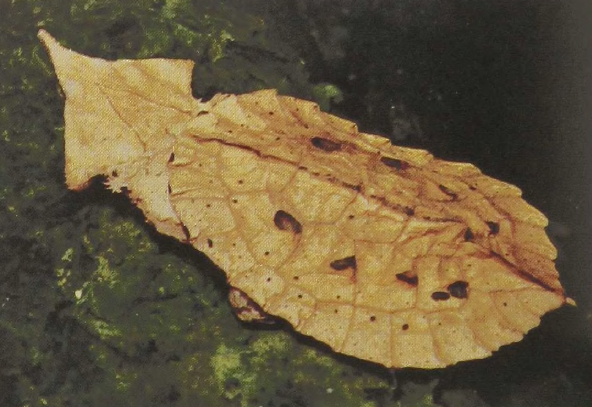 The skin of the limbs and head is covered with loose flaps, folds, and fringes that float with water currents. The name “Mata-mata,” which means “loose skin” in an Indian dialect, is perfectly chosen. The head is pointed and the eyes small, protected, and camouflaged. The mouth is wide and the throat enormous. When hunting, the Mata-mata tenses the throat muscles and then suddenly releases a ratchet on the mouth, causing it to spring open, allowing an inrush of water that sweeps small fishes into the throat. Several little flaps of skin near the edge of the mouth detect the movements of passing fishes, and the trap is triggered more by touch than by sight.